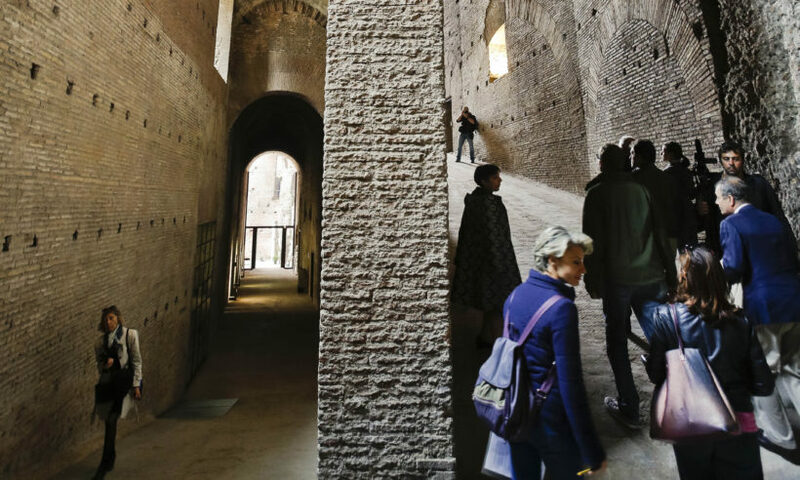 A vast underground passageway that allowed Rome’s emperors to pass unseen from their hilltop palaces to the Roman Forum was opened to the public for the first time on Wednesday, October 21. The 2,000-year-old “imperial ramp” descended from the top of the Palatine Hill, where successive emperors built lavish palaces [including the Imperial Palace], down to the temples, market places and courts of the Forum in the valley below, from where the Roman Empire was governed. Originally more than 300 yards long, it consisted of seven zigzag ramps, four of which remain today. The rest are believed to have been destroyed in an earthquake in the ninth century AD. The gate led to a reception hall which was converted into a church in the Middle Ages. 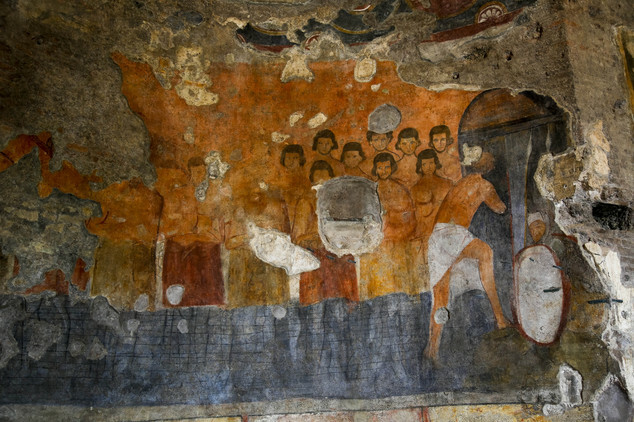 The walls are still decorated with frescoes of “the 40 martyrs,” Roman soldiers from the XII Legion who converted to Christianity and were then made to stand in a lake, naked, on a bitterly cold night, until they froze to death. Partial view of the restored frescoes adorning the Aula entrance to the Imperial Palace, a complex built by Emperor Domitian on the Palatine hill in the Roman Forum, in the 1st century A.D. Rooms that lead off the ramp – possibly used by detachments of guards – have been converted into a mini-museum of Roman artifacts found close to the passageway. 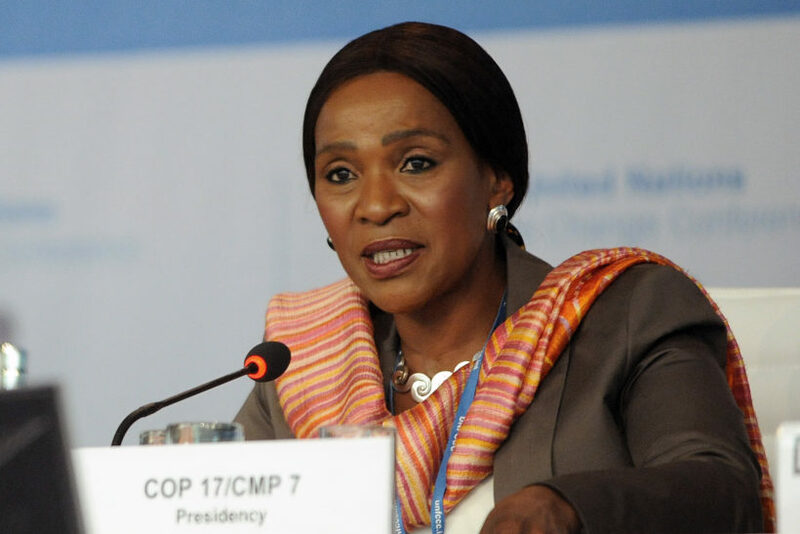 BONN, Germany – South Africa on Monday (Oct. 19) criticized a draft United Nations accord on fighting climate change as a form of “apartheid” against developing nations. A U.N. summit in Paris is supposed to agree to a global accord for trying to end climate change in December, but a last week of negotiations on the draft text, which began in Germany on Monday, got off to a stormy start with developing nations saying their demands had been omitted from the shortened 20-page draft. “It is just like apartheid,” Nozipho Joyce Mxakato-Diseko, South Africa’s delegate who speaks on behalf of the main grouping of more than 130 developing nations and China, told the meeting. “We find ourselves in a position where in essence we are disenfranchised,” she said, saying views of the poor had been ignored. Developing countries said the draft, drawn up by two senior diplomats, favored rich nations and failed to stress that developed nations needed to take the lead in cutting greenhouse gas emissions and to provide far more aid and clean energy technology. U.S. delegation leader Trigg Talley said the new text could work as a basis for talks. “This document has many things that most parties cannot agree with,” he said. Rich nations want to ensure that emerging economies will commit to act. The developing nations won a demand on Monday (Oct. 19) that they could re-insert national demands into the text, raising fears by some that it could again become unwieldy. The previous version ran to 80 pages. 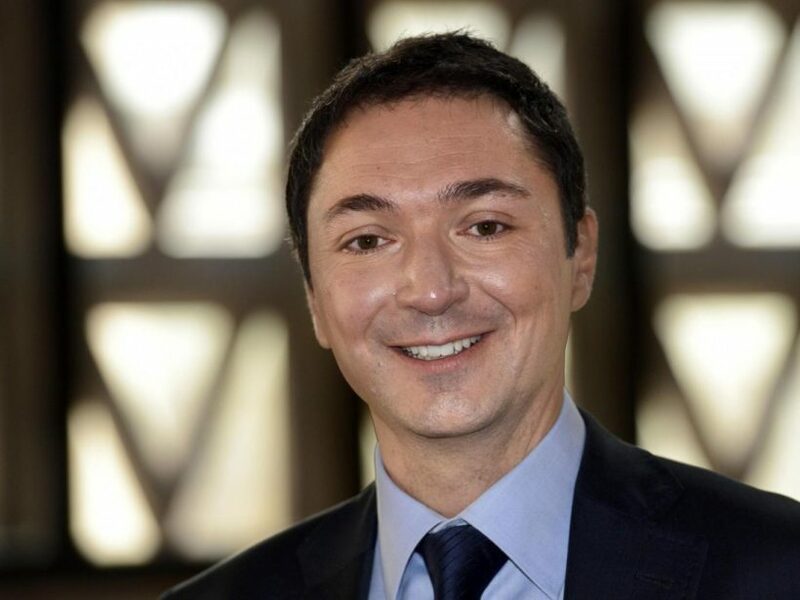 Mr. Verdier, a household name for his nightly forecasts on France 2, has been taken off air after criticizing the world’s top climate change experts. He asserts in the book Climat Investigation (Climate Investigation) that leading climatologists and political leaders have “taken the world hostage” with misleading data. The book was released just before Paris is due to host a crucial UN climate change conference in December. b) What was the Forum? c) From “Background” below the questions: A new crowd-funding initiative, LoveItaly!, was launched to encourage fans around the world to contribute to the upkeep of the country’s artistic treasures amid a decline in public spending for conservation projects. What do you think of the Italian government using this method to raise conservation funding? b) Who is Nozipho Joyce Mxakato-Diseko? c) Why do these countries oppose the UN’s climate change ideas? Forum Superintendent Francesco Prosperetti said the ramp links two very different areas: The public areas of the Forum, where day-to-day business and public administration was conducted and the more private residential area up on the hill. “Today we can give back to the public an unknown portion of the Imperial Palace,” said archaeologist Patrizia Fortini. The ramp boasts seven levels connected by six hairpin turns, some underground and some above ground. It empties onto a hilltop terrace offering stunning views of the Forum, Rome beyond. The ramp was opened to the public on the same day the public was invited to help fund other restorations of Italy’s cultural heritage. A new crowd-funding initiative, LoveItaly!, was launched to encourage fans around the world to contribute to the upkeep of the country’s artistic treasures amid a decline in public spending for conservation projects. The Intergovernmental Panel on Climate Change (IPCC) was established in 1988 by the United Nations. Over the last 25 years, the IPCC became the “gold standard” of climate science, quoted by all the governments of the world. IPCC conclusions are the basis for climate policies imposed by national, provincial, state, and local authorities. Cap-and-trade markets, carbon taxes, ethanol and biodiesel fuel mandates, renewable energy mandates, electric car subsidies, the banning of incandescent light bulbs, and many other governmental policies are the result. Read more about the IPCC from a previous StudentNewsDaily article. He said he decided to write the book in June 2014 when Laurent Fabius, the French foreign minister (equal to U.S. Secretary of State), summoned the country’s main weather presenters and urged them to mention “climate chaos” in their forecasts. Mr. Verdier said: “If a minister decides he is Mr. Weatherman, then Mr. Weatherman can also express himself on the subject in a lucid [clear] manner. Human activity does not affect the earth’s temperature. Burning fossil fuels (gas, coal and oil) does not cause climate change. The earth’s climate changes naturally, but not so much that it will cause a change of catastrophic proportions. An extreme change in the earth’s climate will not happen. There are natural warming and cooling trends over time. In the 1970′s a coming ice age was predicted, but now that scare has been replaced with the current global warming scare. Read the complete letter at: ScienceandPublicPolicy.org.